QuickBooks Desktop allows you to either give a lump sum at the beginning of the year, or choose between two types of paid time off accruals (sick and vacation time) that can be used when paying employees. We’ve made sick and vacation pay more reliable in QuickBooks 2019! Pay stub includes more details about the employee’s accrued, used, and available sick and vacation time. You now have the capability to choose how many hours will be carried over to next year. To learn more about 2019 updates for sick and vacation pay, see Sick Pay Maximums. Select Lists > Payroll Item List. From the Payroll Item drop-down on the bottom left, choose New. Select Custom Setup > Next. Select Wage > Next > Annual Salary or Hourly Wages (depending on whether you have salaried or hourly employees). Select Next > Sick or Vacation Pay > Next. Enter a name for the item, then Next. Note: If you use time off you can rename this item to TO. Choose the expense account you want for the item, then Finish. On the left pane, select Payroll & Employees then go to the Company Preferences tab. Fill in the defaults you want to setup, make sure to check the Do not accrue boxes at the bottom if you do not want time accrued when paying sick/vacation/overtime. Select Employees > Employee Center. Select Payroll Info, then select Sick/Vacation. In the Hours available as of mm/dd/yyyy field, enter the number of paid sick hours that are currently available for the employee to use. Beginning of Year - Grant a certain number of hours that the employee can accrue over the course of a year. Every Paycheck - Accrue certain number of hours per paycheck. Every Hour on Paycheck - Accrue hours on every paycheck. In the Hours Accrued field, enter the number of hours that will be accrued (based on your selection in step 4). For example, you give 80 hours of vacation per year and it is accrued biweekly. You would enter 3.08 hours (80 hours/26 pay periods = 3.08 hours). 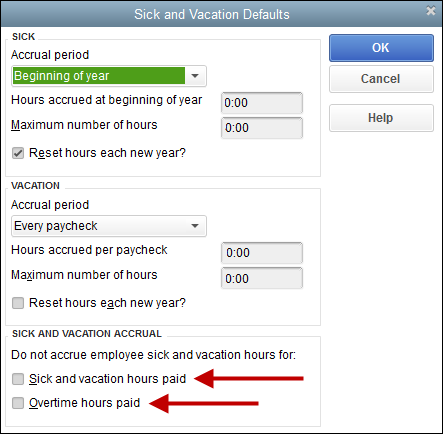 (Optional) In the Maximum number of hours field, enter the maximum balance of sick hours that the employee can have. If you want sick hours to reset to zero when a new accrual year begins, select Reset hours each new year?. Enter the start date of year the accrual year. If the employee accrues sick time on a calendar year, enter January 1. If the employee accrues sick time on a different schedule, for example an anniversary year, enter the day that year begins. Enter the date that sick time should begin accruing. To specify accrual information for vacation hours, repeat steps 4 through 10 for the Vacation section of the window. When creating the paycheck, open the Preview Paycheck window. In the Earnings section, go to the Item Name column and from the drop-down, choose the sick or vacation item you created. For hourly employees, enter an hourly rate in the Rate column and the number of hours in the Hours column. (If the time will be "unpaid," then set the rate to 0). For salaried employees, enter the number of hours worked next to the regular salary earnings item in the Hours column and the number of hours paid for sick/vacation time next to the sick/vacation salary earning item in the Hours column. QuickBooks will divide the salary rate accordingly once the correct number of hours are entered. Note: Sick and Vacation hours used are based on the pay period end date of the paycheck, and not the paycheck date. In addition, Sick and Vacation hours available as of date will update to the most recent paycheck pay period end date for the employee. Select Pay Stub & Voucher Printing. Put a check mark in the Vacation used and vacation available and Sick used and sick available boxes. Select OK, then choose OK to close the preferences window.